Brandyn Callahan became entranced with glass when he discovered the community of glassworkers in his hometown of Portland, Oregon. That infatuation led him to begin his formal glassblowing education in 2009 when he walked into a local studio and asked to work for free. For the last 10 years, Callahan has continued his education and honed his glassblowing skills throughout the Pacific Northwest. 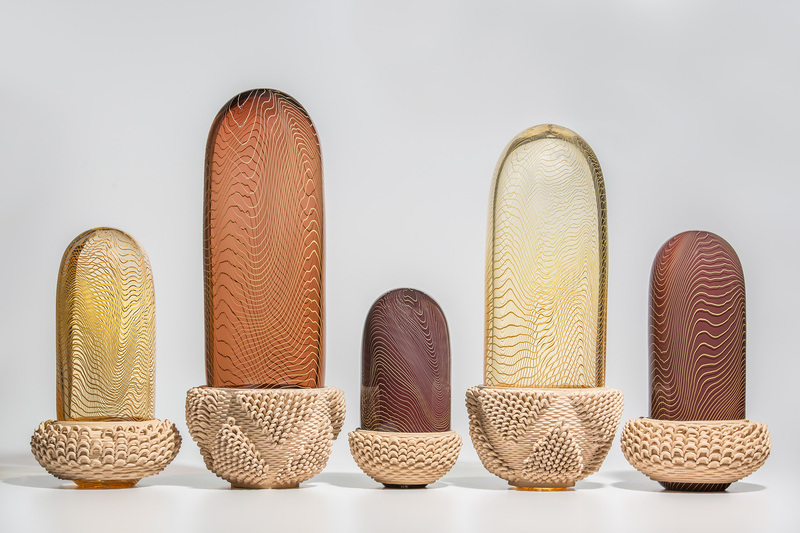 His work combines glass with other elements such as copper, ceramic, and leather to create sculptures with clean lines and textures for visual interest. Currently based in Seattle, Callahan has studied at the Pilchuck Glass School and has worked for masters such as Dale Chihuly, James Mongrain, and Preston Singletary. Callahan comes from a part of the country that has been influential to the Studio Glass movement over the last several decades, but he was excited to first visit Corning in 2012, a town which he said has “such a rich tradition of people blowing glass, engraving glass, and being in the glass industry ... for hundreds of years.” He currently works alongside Martin Blank, Rik Allen, and Shelley Muzylowski-Allen in Seattle. In November 2019, Callahan will be an Artist-in-Residence at The Studio. Collaborating with artist Phirak Suon, they will use The Studio’s resources to explore how digital fabrication and 3-D printing can influence how we produce and think about glass as a material.